Surveying is an integral part of land-use, development and engineering projects, and an essential component in many legal and financial transactions involving real estate. Foresight offers a wide range of surveying services, delivering fast, accurate products tailored to the specific needs of each client. 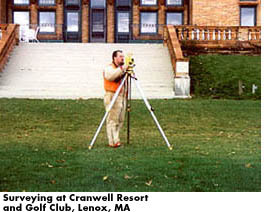 In recent years, we have expanded our Survey Department to provide large-scale surveys throughout Massachusetts and Connecticut. We have recently completed commercial surveys in Worcester, Cambridge, metro-Boston, and other areas of central and eastern Massachusetts; and, in New Haven, Hartford and Naugatuck, Connecticut, among others. Our highly experienced survey staff utilize state of the art computer technology throughout the surveying process -- from electronic total stations for field data collection through deed research and analysis to CAD-drafted plans -- to produce an efficient and accurate final survey. Clients may require a boundary survey for many types of Projects involving transfer of property, subdivision or development of land. Commercial clients need ALTA surveys for refinancing or new construction. 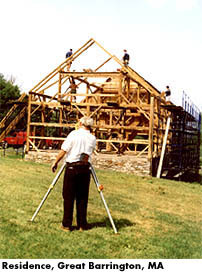 Developers and municipalities often need a utility or easement survey for construction of infrastructure improvements. Architects and builders often require accurate surveys of existing structures and ground features, and precision stakeouts for construction works-in-progress. If you need any of these services, Foresight is ready to assist you.